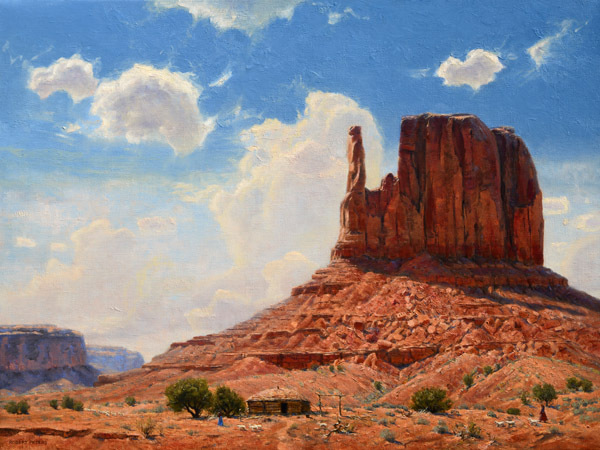 Robert Peters has spent his life living in and absorbing all that the West and its magnificent landscapes offer. The artist states, “My work is grounded in my earliest personal impressions.” As a child, Peters grew up in Arizona, and he remembers fondly family trips that allowed him to hike, fish, and hunt in the wild and wondrous landscapes of southwestern Colorado. In these early years, the artist was just happy to enjoy the experience of being outdoors and eager to take in all that nature offers. Trips to art museums and art classes in college laid the foundation for Peters’ interest in what was to become his passion and career. In college, he began painting seriously; a professor, who was also a successful commercial illustrator, acknowledged and fostered Peters’ talent and potential. With a desire for a career in commercial art, the artist was fortunate to have a mentor who educated him in the various components of the business. The young Peters soon began making a living working with well known advertising and publishing companies in New York without having to live there. Peters thrived in the business and his work was in demand. During this time, he joined the Society of Illustrators. During his successful commercial art career, Peters and his wife moved to Colorado and lived on a ranch where they bred and raised show horses. This rewarding life brought new purpose to his talent as an artist. He began painting the horses they loved and the western landscape. Peters felt compelled to paint full-time and quit commercial art, and his fine art career as a landscape painter was brought to life.